Strap-A-Handle is the easy way to carry computer equipment, stacks of boxes, camping gear, beverage containers, uneven loads, groceries and more. Just wrap the adjustable strap around the load, snap the ends together and lift the EVA-padded handle. 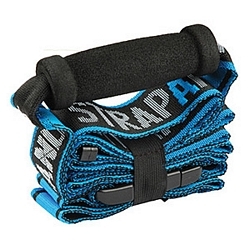 The heavy-duty 2"-wide nylon strap is rated to carry up to 40 lbs.